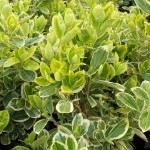 A fast growing shrub with shiny light green oval leaves with creamy white edges. The form is upright. It is adaptable to various soils and is quite salt tolerant. It will withstand heavy pruning. It prefers full sun to part shade. It is useful for screening or as a hedge.